"Here comes the BIG DOG". Looking at the card for this year's Money In The Bank pay-per-view, there are a few matches that stick out as rather pedestrian. For one, Bobby Lashley vs. Sami Zayn is a no-win scenario for WWE. Their feud has been appalling, and it won't be better for Lashley squashing Zayn or Sami pulling a fast one over Bobby. Then, there's Roman Reigns vs. Jinder Mahal, a match that exists only to get Reigns on the show. That is unless WWE have something else in mind for the "Big Dog" and plan to have him force his way back into Brock Lesnar's view. They wouldn't, would they? Maybe they would, and the same writers might just decide that either the Raw or SmackDown Women's Titles need a change too. 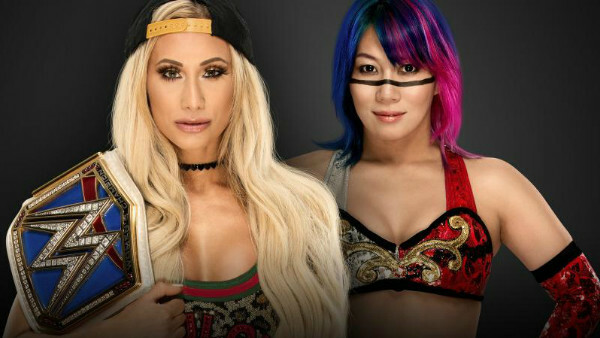 The most likely outcome, should any switch occur, is Asuka prizing the blue version away from Carmella, if only because there's surely more juice left in Ronda Rousey's chase on Raw. WWE have to make the right decisions at MITB. SummerSlam, the next major stop on the calendar (sorry, Extreme Rules) depends on it, and the company must be careful not to undermine their best characters or book shocks just for the sake of it. Like those old Dr. Pepper ads, what's the worst that can happen?